As you may have guessed, the key in using the elliott wave theory in trading is all about being able to correctly identify waves. By developing the right eye in recognizing what wave the market is in, you will be able to find out which side of the market to trade on, long or short. 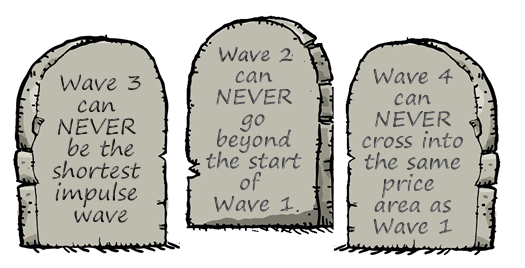 There are three strict cannot-be-broken rules in labeling waves. So, before you jump right in to applying the Elliott Wave Theory to your trading, you must take note of the rules below. Failing to label wave correctly can prove disastrous to your account. Rule Number 1: Wave 3 can NEVER be the shortest impulse wave Rule Number 2: Wave 2 can NEVER go beyond the start of Wave 1 Rule Number 3: Wave 4 can NEVER cross in the same price area as Wave 1 Then, there are the guidelines that help you in correctly labeling waves. Unlike the three strict rules, these guidelines can be broken. Here they are: Conversely, sometimes, Wave 5 does not move beyond the end of wave 3. This is called truncation. Wave 5, more often than not, goes beyond or “breaks through” the trend line drawn off Wave 3 parallel to a trend line connecting the start of Waves 3 and 5. Wave 3 tends to be very long, sharp, and extended. Waves 2 and 4 frequently bounce off Fibonacci retracement levels. With understanding elliott wave rules, we hope we can more precision on reading wave 1 until wave 5 from elliott wave patterns. « Best Technical Indicators For EURUSD Pair?